Divine love—that blissful, quiet stillness within, is real. Every thought, emotion, thing is illusion. I relish the purr of my kitten, the vanilla scent of a ponderosa forest, the taste of sweet cherries, the cool zing of ocean water, laughing with friends and bottomless sleep. I rely on the real. 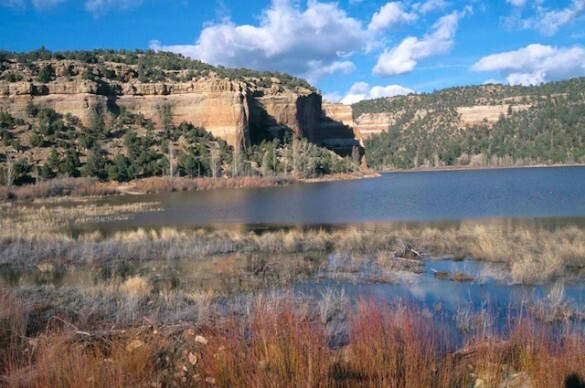 Ramah Lake in western New Mexico. I shot the image, and when I returned a few years later, the lake was gone. 🙂 Ah, Lesley the King! It is always a cheer in the heart to see your expressions. They never fan out…you know…how they just continue to blossom…in all the fields you have glanced upon..thanks for glancing this way. Logan, you are so kind. I really appreciate what you say and only want to live the truth of it: that the Divine will continue to blossom in us all. Eternally. Right back at you, dear friend. We are definitely on a major adventure! The lake is a metaphor of life. Have you ever returned to your childhood home. It’s still there but not at all like it was when you were growing up … as if everything has changed yet remained the same. There is a lesson … the Cosmic Consciousness thought the thought and the Big Bag occurred, but it is illusory. The only thing that is truly real is Spirit, your Spirit, my Spirit, the Spirit of Mother Earth … all part of the Cosmic Consciousness … and it is eternal. Bud, that is lovely. It reminds me of that koan, first there was a mountain, then there was no mountain, then there was a mountain. All of that illusory change, and yet Spirit remains. Thank you so much for your insight! I rely on the Master. Absolutely. Mind doesn’t agree, but I won’t be bullied by my mind and emotions any longer, and turn to His embrace no matter the circumstances. I rely on the process. In the midst of hard times, I KNOW they are purposeful, and that they will bring me greater awareness and connection to my true self and the Divine Current. I rely on fellow wayfarers, for we share the ups and downs of our journeys and inspire ourselves and each other in the process. Thank you so much for your beautiful writings, each one is a treasure. Sage, knowing what you are going through right now makes your comment especially poignant. It does seem that every lesson we encounter is really there to show us where we need to refine our reliance. I’m happy that these writings bring you joy; yours certainly do for me. Hi Lesley! Once again, your words are like an arrow, so laser focused in truth, piercing any hesitation to love. I love how you delineated between what you relish and what you rely upon. I rely on the Master and his promise to me. It truly is that simple, and as Rudy so eloquently stated, “I rely on Love to continue to always be the answer, no matter what the question or concern.” So much love to all of you beautiful lovers of truth. Thank you, Jamie. I love that metaphor: The laser focus of truth piercing any hesitation to love. We can love so completely without ever hurting, as long as we love the real. The photo is beautiful, but your words are filled with soul. Thank you Sara. I am happy whenever anyone recognizes soul in me, in others. You have a beautiful gift. Must check out your site–wonderful name: sunshine and salad. Blessings. I rely on the insights of good friends, who let soul lead their way, to reassure me from time to time that my Path is serving me, no matter the outward conditions. I rely on beautiful souls, such as you, to continue to be courageous examples of what it means to strive for full emancipation. I rely on a Source greater than us all to guide, care for, inspire and liberate us from our own self-created entanglements. I rely on Love to continue to always be the answer, no matter what the question or concern. Very lovely post, my friend. Rudy, what a beautiful piece of writing. I rely on all of those things too, and aren’t we fortunate to know the answer is that simple. Worth repeating what you said: “I rely on Love to continue to always be the answer, no matter what the question or concern.” You are a treasure! Thank you, Virginia. Yes, my reliance on some of those very things prompted this post. We are definitely drawing from the same Source. So happy to be traveling this path with you, dear friend.